Welcome to the Election Results Headquarters for Election 2010. Winners for all federal and state races will be identified on our site as soon as they are confirmed and can be entered into our system. 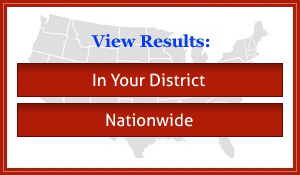 You may view results In Your District (address information will be requested) or you may search results state by state. Please use our Media Coverage links to the right for the most up to date news from major national media outlets. When Will Results be Entered? We will begin entering results the evening of November 2nd. We will enter federal races first and then state races. We expect that all certified state results will be in our system by the end of the day Friday, November 5th. How Will Winners Be Identified? All results reported on this site by DDC Advocacy have been gathered from a minimum of four credible news sources and or fit within the 3 percentage point criteria set. However, given the nature of election results reporting and the fact that final vote counts, including absentee ballots, may be too close to call or not available for several weeks following Election Day, we cannot certify that these are official election results. For certified election results, please visit your state website.